Starting January 22, 2019, the Peninsula College Foundation is offering over $100,000.00 in scholarship awards to students attending Peninsula College for the 2019-2020 school year! Students can apply for these scholarships via www.theWashBoard.org. Go to www.theWashBoard.org to create a log in and start your personal profile. Please Note: DO NOT USE INTERNET EXPLORER. You must use a Firefox or Chrome web browser to effectively navigate the WashBoard site. Enter Peninsula College in the "search scholarships” box in the upper right-hand corner. Review each scholarship's criteria and application deadline date, and apply! The deadlines for applications will vary, with the majority due Sunday, April 21, 2019 (check the deadline for each scholarship). Award notifications will be provided to students beginning Monday, May 20, 2019, with the remainder through mid-July, or later. Please note that late or incomplete applications will not be considered. To view the full list of available Peninsula College and PC Foundation scholarships, visit www.theWashBoard.org, or view the "2019-2020 PC Foundation Full Scholarship List and Criteria" pdf in "Related Documents" below. Check back frequently, as additional scholarship may become available. You can find a list of additional outside scholarships on the Additional Scholarship Resources page. Start Early! Peninsula College Foundation only accepts applications that are submitted through the online portal www.theWashBoard.org. The application process opened on www.theWashBoard.org on January 22, 2019. Deadlines to submit will vary, with the majority due by end-of-day on Sunday, April 21, 2019 (check the deadline date for each scholarship). Many scholarships require at least one letter of recommendation, personal essays, and unofficial transcripts to complete your applications. Don’t wait until the last minute to start , as late or incomplete applications will not be considered! Complete Your Profile! The more complete your profile, the better informed the scholarship committee will be when making final decisions about who to award. Wow Them with Your Personal Statement! Personal statements and essays are the best way to tell the scholarship committee why you deserve this scholarship. Be sure to provide well-written, creative statements that define your aspirations, educational and career goals, your talents, and why YOU deserve to be awarded. Follow Directions! Be sure to read the application requirements closely and follow the instructions word-for-word. At the same time, keep it simple. Don’t waste time submitting additional materials that are not required because they will not be included in the review process. Submit On Time! You must submit your completed application(s) by the end-of-day on the deadline date indicated, or your application will not be considered. For full details, please read the 2019-2020 PC Foundation Instructions, Eligibility, and Award Notifications document below. 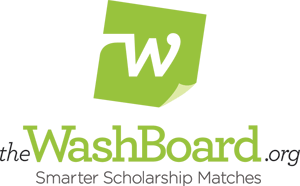 Designed to be a one-stop-site, theWashBoard.org is a free, student-centered, online clearinghouse for Washington students seeking college scholarships. This user-friendly site allows students to search and apply for verified scholarships that are specific to their academic interests, college or university, or other criteria. And it is advertising and spam-free. Scholarship providers will benefit from the increased exposure, reduced paperwork and access to statewide scholarship data. To get started, visit theWashBoard.org and register today!